What is a Sweeper-Scrubber? Let’s break down the name. Sweepers pick up dry dirt and debris. Scrubbers agitate and wet-clean dirt on floor surfaces. Hoo-boy, now let’s really confuse you with this last term. Sweeper-Scrubbers also sweep and scrub. I know, right? 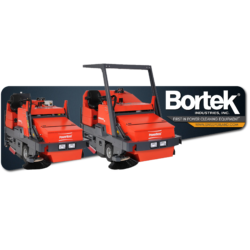 It’s especially confusing because the standard in our industry is to use the term “Sweeper-Scrubbers” to encompass both types of machines that technically sweep and scrub. There IS a difference, though. To help illustrate that point, take a look at the image below. The Nautilus is a cylindrical brush scrubber that can also sweep up dust and small debris with its scrub brush. 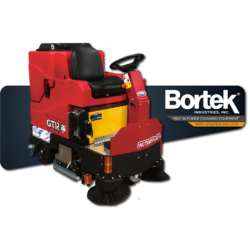 The Commander T82, on the other hand, is essentially two machines in one; a sweeper and scrubber working in tandem. From left to right: (1) Optional disc scrub brush cleans close to walls, (2) water and chemical dispenses ahead of cylindrical scrub brushes, (3) cylindrical scrub brushes scrub floor and sweep debris into hopper, (4) squeegee and vacuum collect dirty liquid into recovery tank. This is the most popular combination sweeper-scrubber option. It can pick up bits of debris and perform wet cleaning at the same time, in a single pass. This is possible thanks to cylindrical scrub brushes (pictured above in the middle of the machine). These brushes are able to deposit small objects in the hopper and perform wet-cleaning on the floor at the same time. In other words, if your scrubber has a cylindrical brush and somewhere to put solid debris, it can be considered a scrubber-sweeper. 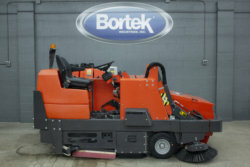 There are several advantages of a scrubber-sweeper over a sweeper-scrubber. 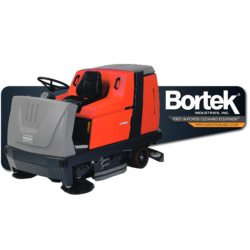 Since all of a scrubber-sweeper’s cleaning is done at once, it ends up being a more compact machine with a comparatively simple construction. 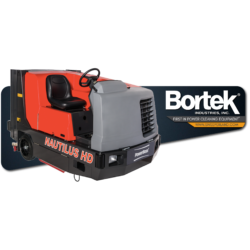 This means greater ease-of-use, lower maintenance costs, lower machine cost, and higher maneuverability and visibility. On the other hand, scrubber-sweepers aren’t capable of the sweeping strength of a dedicated sweeper or a sweeper-scrubber. If you’re dealing with heavy dust, dirt, and larger debris, the scrubber-sweeper’s cylindrical brush will struggle to handle it. If that’s your situation, you’re better off getting a sweeper to complement your scrubber-sweeper, or a sweeper-scrubber. Also, since scrubber-sweepers always scrub and sweep simultaneously, they’re only built to be used indoors. From left to right: (1) Side broom directs debris inward, (2) main broom sweeps dry debris into hopper and filter, (3) disc brushes clean surface with dispensed chemical solution, (4) squeegee and vacuum collect used cleaning liquid into recovery tank. 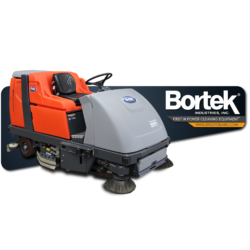 Sweeper-scrubbers are essentially two machines in one. Rather than sweeping and scrubbing with the same mechanism, they separate their sweeping and scrubbing functions into two distinct sections. Mechanically it’s a more complex solution, but the separation of sweeping and scrubbing grants additional control to the operator. Simultaneous debris sweeping and wet cleaning isn’t always necessary for every job. 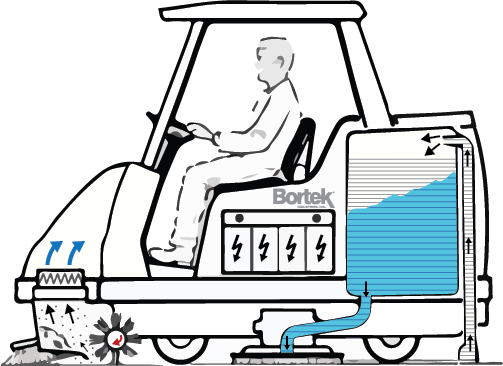 In these cases, the machine operator can turn off either the sweeper or the scrubber functionality in order to perform only what’s necessary. That means higher versatility, and the ability to use the machine as a sweeper outdoors. However, this versatility comes at a cost. Sweeper-Scrubbers are more expensive machines to buy and repair. And, while they are able to sweep and scrub, both functions tend to be less effective than that of dedicated sweeper and scrubber machines. 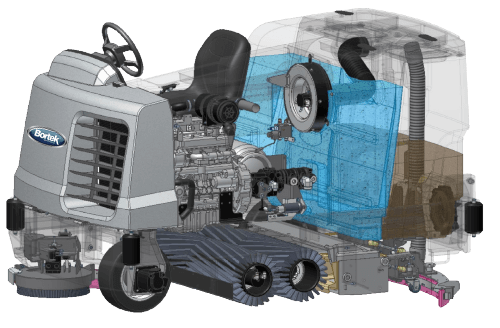 Their design also necessitates a larger machine, which means lower visibility and maneuverability. Relying on a single machine for both sweeping and scrubbing can be a risk as well. 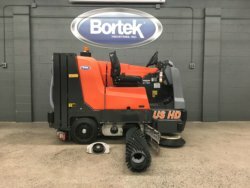 If a sweeper-scrubber falls into disrepair, it will bring all cleaning to a halt; whereas cleaning with separate, specialized machines would leave an alternative machine to use while awaiting repairs. Admittedly, the scrubber-sweeper appears to be the better option when comparing the pros and cons. And, well, it usually is, but there are some situations that are a better fit for a sweeper-scrubber. It all comes down to what equipment or combination of equipment is best suited for your unique needs. Still not sure what’s best for you? Weigh your options and get advice from an equipment specialist!